A presenter at the NIEA Convention held this year in Anchorage, Alaska. 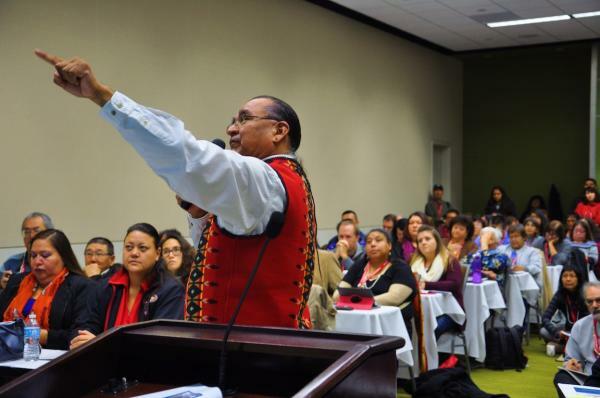 Consultation, accountability and transparency were the call-to-arms at the National Indian Education Convention held earlier this month in Anchorage, Alaska. This year’s conference, entitled “Building Education Through the Generations,” saw unprecedented attention from the federal government, including visits from Senator Jon Tester, Chairman of the Senate Committee on Indian Affairs; the director of the Bureau of Indian Education, Dr. Charles “Monty” Russell; and Bill Mendoza, Director of the White House Initiative on American Indian and Alaska Native Affairs. Among the highlights of the convention was a speech by Senator Jon Tester of Montana in which he announced the introduction of new, comprehensive Indian education legislation that will improve Native education from early childhood education through post secondary, including bolstering language immersion programs, resources for teacher recruitment and retention in Native school districts, as well as streamlined and simplified funding applications, among other initiatives. Also unique at this year’s conference were the “townhalls” hosted by the Bureau of Indian Education head Dr. Charles “Monty” Roessel (Navajo), who was appointed to the post in December 2013 by Kevin Washburn, Assistant Secretary of the Bureau of Indian Affairs. To underscore the importance of education to the BIA, Washburn’s chief of staff was also in attendance. The townhalls served as a dialogue between Dr. Roessel, the BIA, and the NIEA membership that provided an opportunity for educators to voice their concerns and frustrations, as well as their successes and hopes for their schools and students for the coming years. Some of their requests included increased transparency and accountability in reforming Indian education; inclusion in planning and decision-making for their school districts; and additional, on-going consultations with the tribes in regards to the performance of the BIE schools. Mendoza attended the convention to announce a new Native youth initiative which includes comprehensive funding for “wrap-around” services for tribal students. Rose also said that among the most important priorities of the tribes is the ability to operate all title funds as they see fit on their lands. As the demand for education continues to increase, she added that Indian education should also encompass a worldview, which recognizes a global economy and the importance of a skilled and educated workforce in Native communities. During his speech to the general assembly of this year’s convention, Senator Tester explicitly noted that community involvement with the inclusion of administrators, teachers and parents in collaboration with the government agencies are critical to improved outcomes in Indian education. This entry was posted in Education and tagged Indian Education, NIEA Convention by Kim Kalliber. Bookmark the permalink.